When life gives you organic lemons. 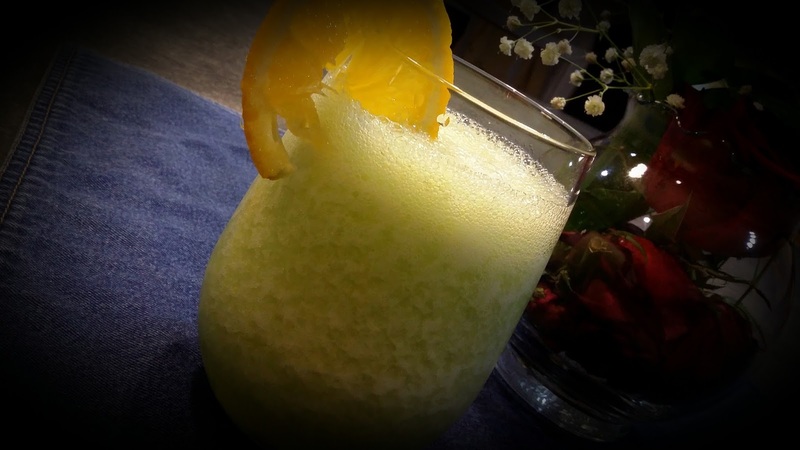 . . . . and organic honeydew. . . . and organic oranges, you mix them with vodka and make a frozen alcoholic treat! We received a honeydew melon in our Organic Family Sampler last week. It definitely needed to be cut today! I saved one cup of it in the kitchen freezer to make a frozen drink with it. Here's a little fact about me: My absolute favorite candle scent of all time is honeydew. I just can't even tell you how much I love it. I remember when I still lived at home in Florida. . . . . before I moved north to be with the love of my life. . . . . I had a huge three-wick candle that was honeydew. I loved that thing. It's been a while since I've had a really good honeydew candle. After I cut the honeydew, I stood there for a couple minutes and just sniffed what was left of the rind. I'm not even kidding! Anyway. . . . . . 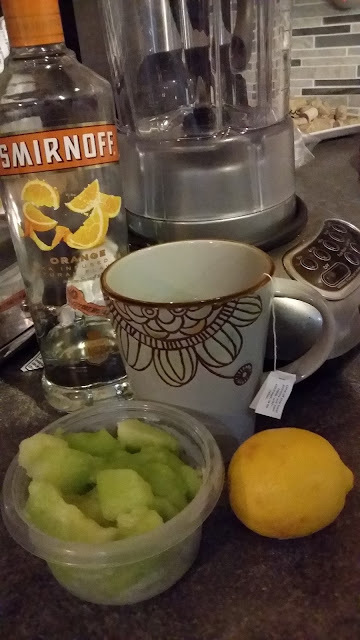 I also used one of my organic lemons and a slice of our organic orange for the garnish. The recipe is fairly simple. The hardest part is brewing the ginger tea. And the slowest part is waiting for the honeydew to freeze. I left mine in the freezer for about two hours maybe. Okay. . . . . maybe I changed my mind. The hardest part is blending the drink in the blender while you're trying to be quiet because the kids are already in bed! Blend for about 20 seconds, pour into a glass and garnish with an orange slice. What's your favorite way to eat honeydew? Know any good recipes? Or do you just cut and eat?